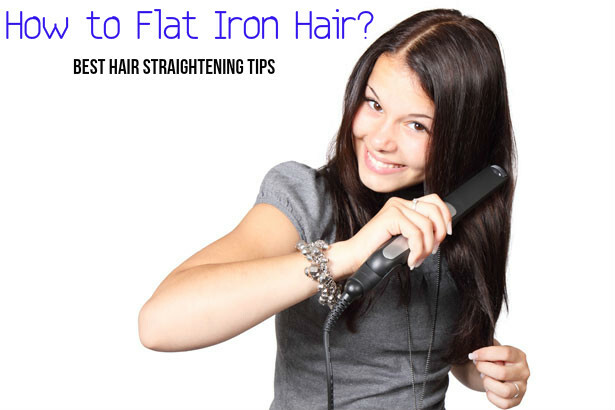 Flat Iron is also known as hair tong and it is one of the favourite hair styling tools among girls. It helps in straightening your hair and is heating tool that helps in giving you the desired shape for your hair. If you think that this tool is a modern invention, you are wrong. The concept of hair styling tool was developed as early as 1800s. During those times the ladies were very fashion conscious and were much more aware than the ladies of modern times. Eventually the tool was developed. Today it is more user-friendly and has a stylish appearance. Despite many of its benefits, this tool causes some problems for the users who use it every day. If you are a regular user of this tool, you may be aware that some days you will never get the straightening done in the right way. This can make you very frustrated. It may be due to the wrong technique or the wrong product. So, it is important that you know how to use it in the right way. One thing to remember is never to start before your flat iron is fully hot and ready to use. Make sure that your hair tong is at the correct temperature. As you know, the flat iron can do its job well only if it is properly heated. If it is not heated to the correct temperature, your hair will start to curl after a few hours. Always keep your flat iron clean and well maintained. Treat this devise as you do any other equipment. If there is dust on the iron, it can hamper the heat. This will have an adverse affect on your hair as well. So, it is important that you clean it well. If not, you will not be able to get the straightening in the right way. Moreover, the dust, grime and grease that may be present on the iron may stick to your hair if it is not cleaned well. This can cause damage o you hair and also make your hair clump together. You also have to wash your hair well. Before you begin ironing your hair, you have to brush or comb your hair properly. If your hair is curly, then you should remember to comb your hair between straightening. This way you will get the right shape you desire and it lasts for a longer time. When you iron your hair, remember to start from the back of your head. Then slowly you can proceed to the front. The hair in front should be the last to be straightened. Even professionals stress on this fact. When you divide your hair into different sections for straightening your hair, go for one-inch sections of hair at a time. This means that you have to take one-inch section of hair at a time and iron it well before you go for the next section. You have to be really patient when you do this as this is a very slow process. But this will give you perfectly straight hair that will last longer. If you use flat iron daily, make sure that you use hydrating shampoo and conditioner on your hair. It is better if you use a ceramic plated hair straightener. This can reduce the damage and give you better results. It also helps in reducing the frizz. Before you start straightening your hair, make sure to use a heat protectant on your hair. Hair dryer is also a must. It is good for your hair when you use hair straightening gel or lotion with the iron. Using hair dryer gives bounce to your hair and also cools your hair at the time of using a hot iron for straightening the hair. The easiest way to straighten your hair is to do it in sections. This helps in giving volume to your hair. Frizzy hair tends to have more volume than straight hair. By doing the hair straightening process in the correct way, your hair will have good volume. Always go for different clips. They should always be a part of your kit. There are various flat rollers available. The best variety is one that can untangle your hair and has various other functions. Rollers may have different attachments as well. Rollers help in giving you different styles. You can pick one according to your need. The most important tool that should be there in the hair straightening kit is the hair iron. Try to choose a hair iron that is best in the market, even if it is expensive. The most important feature of the hair iron that you should look for is the temperature control. If you can control the temperature of the hair iron, the hair straightening process will be made much easier. You can style your hair straight easily and also get any other look you prefer to have. This tool is a must in your hair straightening kit. Choose the right brush. You get different brushes in the market. Round hair brush with metal core is one of the best hair brushes you can use. This brush makes it easy for you to untangle your curls. You also need brush with soft bristles. This brush will help you t straighten your hair as you iron your hair. Before you buy a hair straightening kit, do some research of your own and choose the right one for you. There are many varieties available in the market. Some brands promise to give you straight hair within minutes. Choose one that is best for you and safe for your hair.